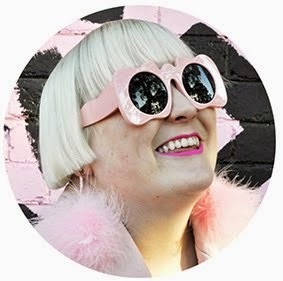 Fashion Hayley: Newsflash: Trimapee, the best show of the week tickets are still available!!! Newsflash: Trimapee, the best show of the week tickets are still available!!! Its your LAST CHANCE for Tickets to the hottest show this fashion week. 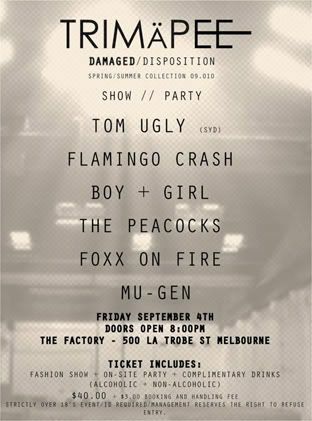 The Trimapee Damaged/Disposition show and party promises to one fun night of fashion, music and dancing! It's on on Friday September 4th from 8:00pm at The Factory, 500 LaTrobe Street, a relativly new venue which I have recently used myself for a fashion shoot and where the recent This is not a design market was held. With its vast open interior, grubby grafiti'd walls and old factory chains laying about it has that "derelict" vibe that suits Trimapee's aesthetic perfectly. Expect to see distressed hems, androynous womenswear and lots of people having fun. You can buy tickets for only $43 online here or alternatively you can visit the guys in-store at The Milk Shop Gang, 78 Johnston Street, Fitzroy. I'm so excited about this event, and am looking forward to seeing you there. Aww it's over 18! Sounds interesting though.